"Today should be a time for the UN to show solidarity with the victims -- the millions of North Koreans brutalized by Kim's merciless policies of starvation and oppression -- and not with the perpetrators." 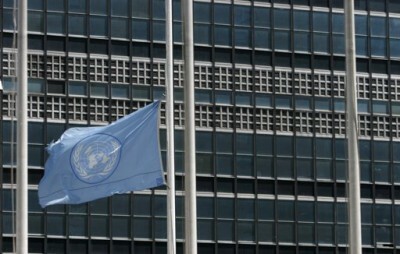 This image is being posted all over the internet, its the flags at the UN headquarters in New York City at half mast because of the funeral of Kim Jong Il. Its fun to giggle at the lunatic dictator but he's also a horrendous, brutal murderer and tyrant who has starved and brutalized his own people so much the average height of North Koreans has been dropping over the last few years. Kim Jong Il was a terrible person and a ghastly dictator. This is like putting the flag at half mast for Pol Pot's funeral or for Idi Amin. But the United Nations sort of has to do this, to show respect for a world leader. The problem is that the UN by its charter and definition cannot discriminate between a tyrant and a democratic leader. It has no method or ability to distinguish between liberty and oppression, between good and bad. That's why nations such as Syria are on the UN Human Rights council, because everyone has to get a shot at each committee, as everyone is treated as functionally equivalent. Every nation gets a seat at every table no matter what a horrific monster their government might be. So Nicolai Ceauscescu is treated the same as JFK. So its customary for the UN to lower their flags to half mast for the death of any world leader no matter whom. When Stalin died... the flags were at half mast. If the UN had been around in WW2, They'd have put the flags at half mast for Hitler, probably. I don't know if they did it for Khadaffi but it wouldn't surprise me. Tyrants, thugs, and brutal dictators have a strong voice in the UN's decision making process. The people in charge of the UN are moral relativists, and do not believe in any overarching absolute ethical standard. This would give too much power to nations such as the US who are not brutal tyrannies, and that's something people who work at and lead the UN find a dreadful prospect. So the UN is basically a gigantic money sink that tries to do good around the world and manages to do it hap hazardly, inefficiently, and unevenly while countries such as the US roll up the day of a disaster and start helping immediately. You know, one (and only one) of the current Republican Presidential candidates has authored numerous bills calling for the US to withdraw membership and funding from the UN. Three guesses as to who it is. Yeah, Ron Paul is a useful legislator, which is where he ought to stay. He can't get bills introduced or passed as a president, that's a legislator's job.